In 1989, Spike Lee created a marketing phenomenon with the “It’s gotta be the shoes” campaign featuring Michael Jordan and Nike’s Air Jordan’s. I was only nine-years-old at the time, but pleaded with and begged my parents for a pair of these shoes that would cost a small fortune for my parents. If only I could acquire a pair of these shoes, then surely I would be the top basketball draft pick of the playground selection committee. In the end, I did not get my wish with the shoes, but I never seemed to lose my desire for finding the right shoe to “lead me to the promised land” in terms of athletic performance. In 2011 I was increasing my running mileage and was getting occasional aches and pains which I attributed to my poor running shoes. At around the same time I read a book, like millions of other Americans, entitled Born to Run. In the book, the author Christopher McDougall tells the very entertaining story of the Tarahumara Indians and “Caballo Blanco” who all run in minimalist footwear. Intrigued by the information presented in the book, I decided to invest in a pair of Vibram Five Fingers. As soon as I put the shoes on my feet, my running form was dramatically altered. After running in the Five Fingers shoes for about 1.5 miles, my calf muscles were exhausted. The next day, I could barely walk due to muscle soreness. As the weeks went by, my running form continued to change and my legs became stronger in different ways in order to adapt to the new form. For me, this discovery was pivotal. At the same time that I was experimenting with minimalist footwear, millions of other Americans were doing the same thing. Some runners were acquiring a changed running form which resulted in improved athletic performance, others simply acquired injuries. The minimalist footwear market was said to have peaked in 2012 at roughly $400 million. In its “heyday” minimalist footwear was not only the topic of conversation in the running shoe industry, but also in the medical community. Once again, a question was being raised about a shoe’s ability to improve athletic performance or to help avoid injury. Today the pendulum has swung far from minimalist footwear, but the end goal remains the same. Now the question is, “Can maximum cushioning on a shoe prevent injury or improve athletic performance?”. This new fad, which began approximately two years ago, was to go to maximal cushioning in footwear. 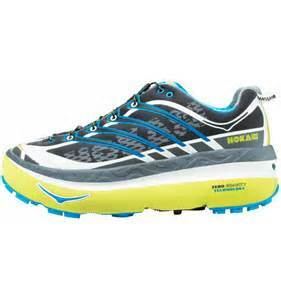 Brands such as the Hoka One One are an example of a maximalist shoe yet surprisingly light weight. One of the theories behind maximal footwear is that it allows your body to take on greater workloads (such as greater miles) while keeping the amount of stress placed on joints to a minimum. Some athletes have switched over to this type of footwear and found the results to be beneficial to their training capabilities. One such athlete is Leo Manzano, an American Olympic medalist in the 1,500 meters. Leo is now sponsored by Hoka and he claims that by wearing Hoka’s his legs now feel “fresh after long runs” in a recent article with the NY Times. Other runners are less enthusiastic about the maximalist footwear. Long time local runner Dan Nephin tried out the Hoka’s after the Boston Marathon in 2014. At first, Dan said “The debut run was amazingly cushy. Almost spongy.” but after several hundred miles he reports “After a while, the super cushy sensation and platform sensation went away”. As the performance shoe pendulum swings from minimal cushion to maximal cushion, I feel that one constant remains the same, the need to address other muscle imbalances that may impact running form. No matter what type of shoe you are putting on your feet, without good mechanics, running will likely result in an injury at some point in time. Jay Dicharry, a leading physical therapist who works with multiple top endurance athletes states in the same NY times article, “There is a lot of evidence to show that people who spend more time improving their bodies, as opposed to shopping for shoes, are the ones who are going to run better”. As stated in a previous post, the average runner purchases 2.2 pairs of shoes prior to seeking medical attention. If you are struggling with pain after increased activity, consider contacting your local physical therapy practice or family physician about possible muscle imbalances that could be causing your pain. Frequently we find that people who focus on improving their pelvic and mechanics not only feel better but also perform better than those putting more value and confidence in the performance of the shoes they are wearing. Next > African running dominance. American eating dominance.